4th Tuesday - 5:30 p.m. 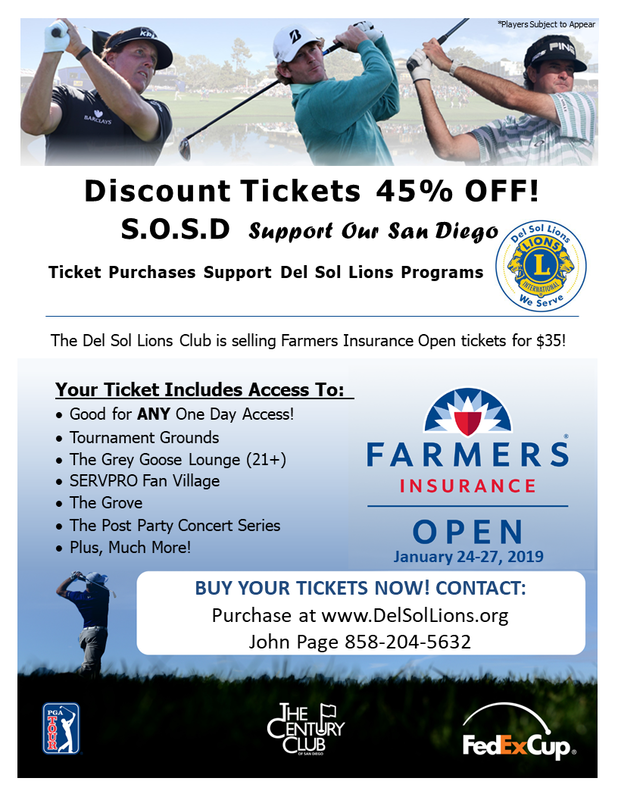 Farmers Insurance Open Tickets 45% OFF! The Del Sol Lions Club was chartered on February 15, 2010, and is part of Lions Clubs International (LCI), the world's largest service club organization with more than 1.35 million members in more than 45,000 clubs worldwide. Lions serve those less fortunate locally, regionally, nationally and internationally. In addition, Lions provides opportunities for both women and men to learn, and assume leadership roles. Our club meets on the 4th Tuesday of each month at Fletcher Cove Community Center at 133 Pacific Avenue in Solana Beach. Our meetings run from 5:30 – 7:00 p.m. to provide time for socializing, learning about our club's latest service projects, conduct any business, and listen to relevant presentations on community needs both locally, regionally, nationally and internationally. Our Board of Directors meets on the 1st Tuesday of each month from 6:00 - 7:30 p.m. at the Fletcher Cove Community Center at 133 Pacific Avenue in Solana Beach. All club members are welcome to attend our Board meetings! Please consider supporting us at no cost to you, while you do your online shopping. Just click on the adjacent eScrip logo and shop as you normally do at Amazon, REI, Best Buy, 1-800-Flowers, Priceline, 1-800-Petmeds, Barnes & Noble and 100's more. When you do, we receive up to 11% of the purchase price as a charitable donation from the store, and we give 100% of that donation back to our community. All at NO cost to you? Thank you for your support! Do you shop at Cardiff Seaside Market?? Then visit www.escrip.com and register and everytime you shop or dine there, we receive a donation from the store. You don't need a card or number, it's automatic and no cost to you. Contact us at delsollionsfoundation@yahoo.com if you have any questions. Membership in our Del Sol Lions Club is open to all and we want to personally invite you to be a member of our new club by contacting our membership director Kristin Salgado, kristinsalgado@cox.net. You can also view, print out, and fill in our membership application form. You don't even have to live in the Del Sol area to be a member and our club has no attendance requirements! Our primary goal is to provide service and networking opportunities for those looking to give back to our community. Annual dues are only $95 for the first household member and $65 for all other household members that choose to join. There is a one-time $35 application fee for membership. All of us are committed to making our community a better place to live, work and raise our families. 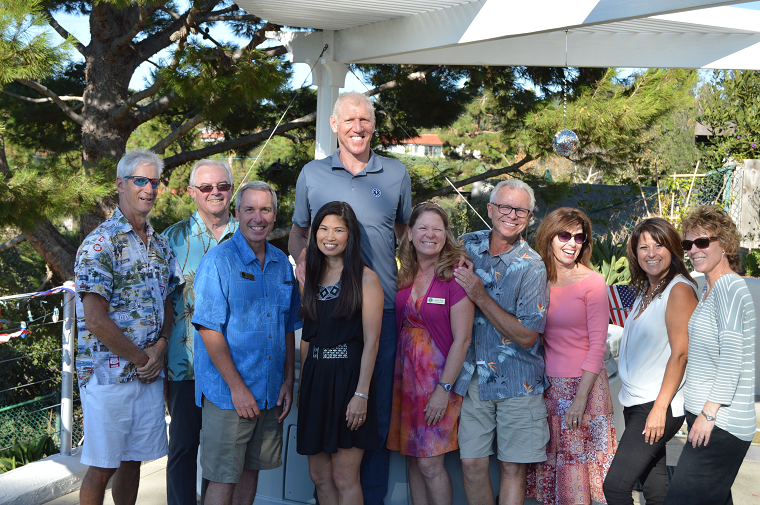 Many of us decided to charter a new Lions Club in the Del Mar/Solana Beach/Carmel Valley/Rancho Santa Fe/Fairbanks Ranch area to better serve our communities. Our club continues to grow with over 55 members and our community service is already helping those less fortunate in our region. We hope that you will consider joining us today! See us on Facebook at facebook.com/DelSolLions.